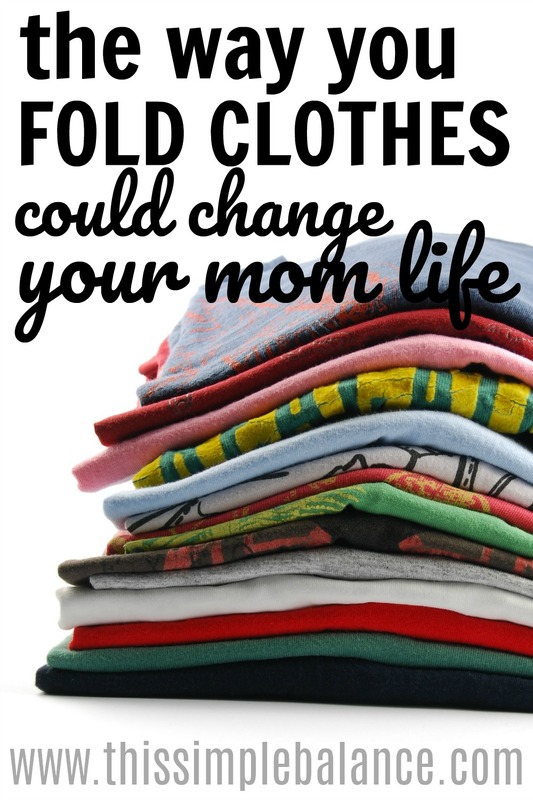 Inside: Folding your clothes using the Kon Mari method will literally change your life. No more messy drawers! Laundry and dishes. The two constants of life with kids, and ever so controversial. Marie Kondo’s best-selling book The Life-Changing Magic of Tidying Up changed my life for the better in so many ways. 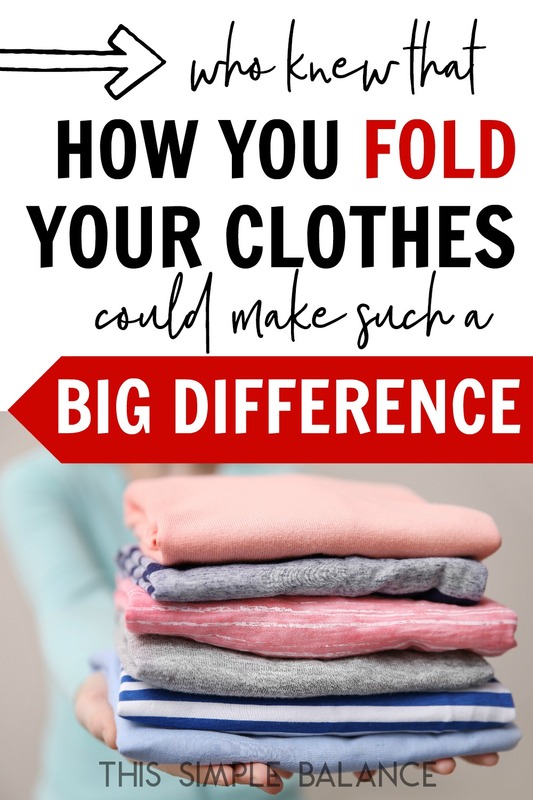 Her method for folding clothes, simple though it may seem, ranked high in my “biggest takeaways” from the book because it eliminated a major source of frustration for me as a mom, wife, and homemaker. Because Marie Kondo’s methods have become so normal to me, I sometimes forget what my life was like before The Life Changing Magic of Tidying Up, when clothing storage was overwhelming and time-consuming. 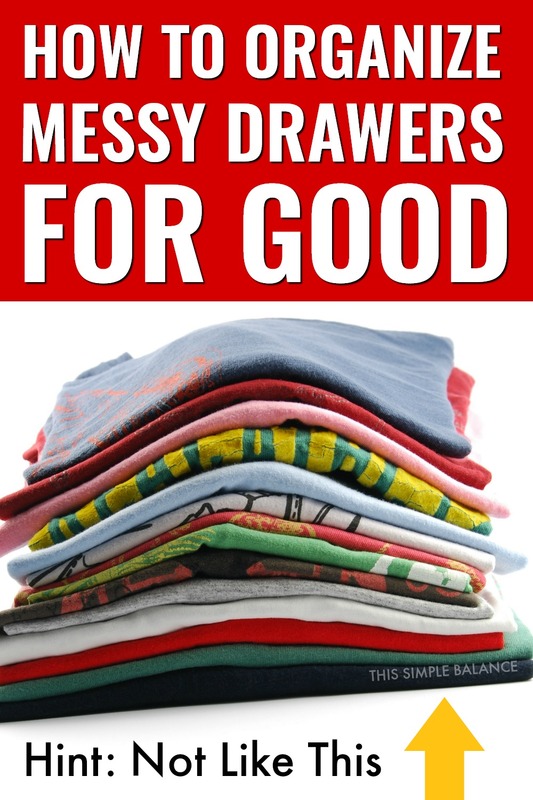 I don’t know about you, but messy drawers drive me crazy! Between my husband’s drawers and my kid’s, I was constantly straightening and tidying, showing them how to lift stacked shirts to carefully pull out the one they wanted (ok, I didn’t do this with my husband, but even if I had, I don’t think it would make much of a difference). Even with careful instruction, the kids just didn’t get it. They either rifled through the clothes to find the one they wanted, or worse, they dumped each neatly folded shirt on the floor to get to their goal. Argh!! Just like with storage solutions, I had a choice to make: Continue to force my system that I liked and cam naturally to me, or adopt a new system and eliminate fighting and frustration for everyone. Don’t force your system when it isn’t working. Choose a new one instead. Adopting Kondo’s method for folding clothes took time to learn. Old habits die hard, especially a habit as ingrained in you as folding clothes. But once I mastered the method, I never looked back because it so dramatically impacted my day-to-day life. One of my favorite bloggers, Abby Lawson of Just a Girl and Her Blog, recently started a Youtube channel called Abby Organizes. A recent video shows exactly how to fold clothes using the KonMari Method. 1) All the choices are visible. With the classic stacking method of clothing storage, you can only see the shirt on top. To find other shirts, you need to sift carefully through each one, then slide it out from under or between every other shirt. If you think about it, it’s really quite difficult to do so without totally destroying the entire drawer. 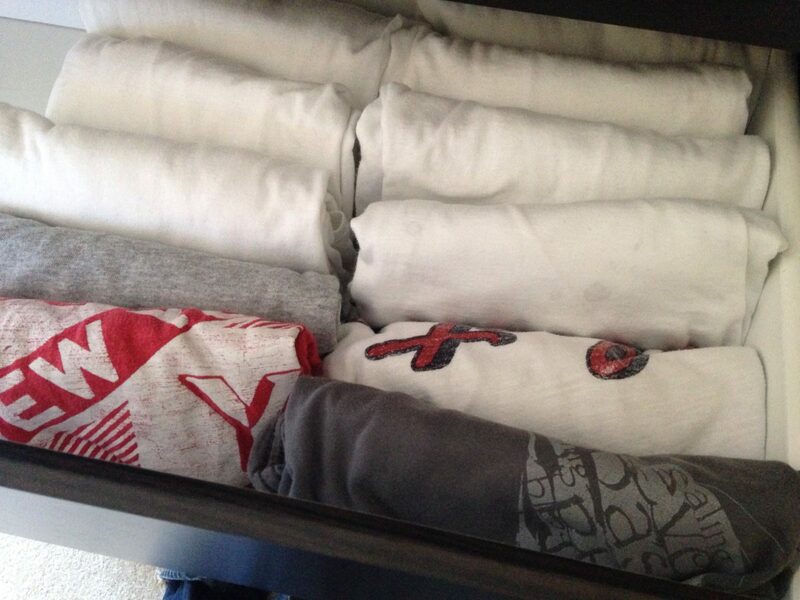 With the Konmari method of folding, a section of each shirt is visible. 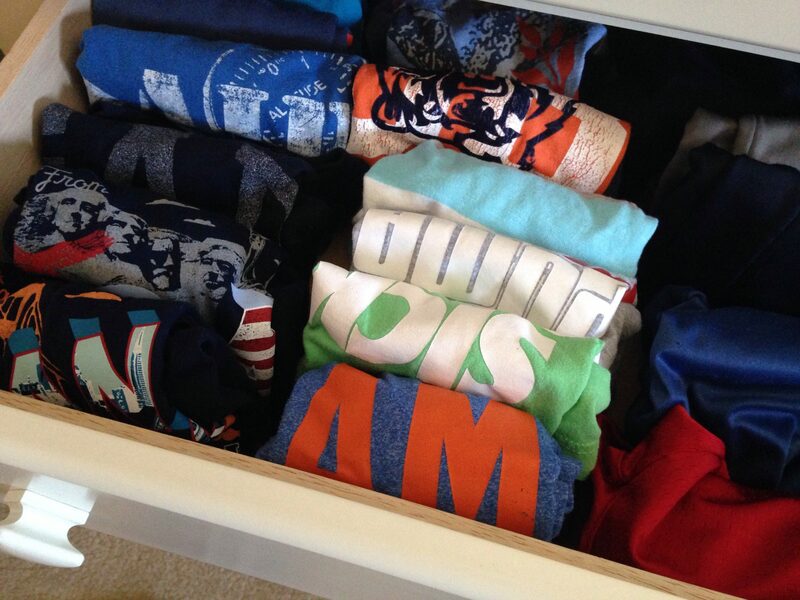 You can easily grab a shirt without disturbing the contents of the entire drawer. No more kids (or husband) dumping the entire drawer to get what they need. 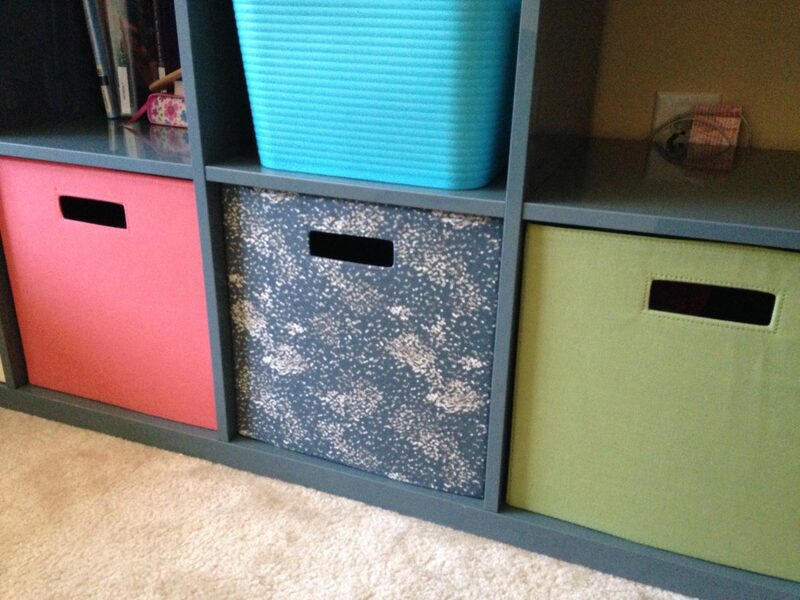 2) It maximizes storage space. Before the Konmari method, my husband and I each our own [stuffed] dresser for most of our clothes, and our closet space was sadly underutilized. After decluttering, my husband and I now share a single, small dresser. The rest of our clothes are hung in two relatively small closets, with room to spare. Before, the kids’ dresser and closet was jam packed. Now, my three boys share one dresser with five drawers total, and unless the baby is in a dumping mood, they easily grab their clothes in the morning. My daughter’s clothing storage is a bit of an experiment, which I’ll explain later. 3) Maintaining a minimalist/capsule wardrobe is easier. 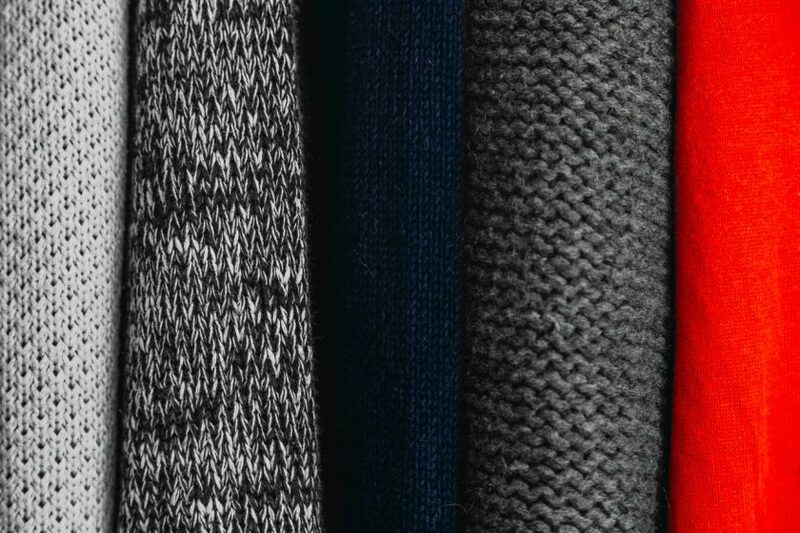 When you can see everything in your wardrobe at a glance, choosing clothes is much easier. Clothes are also far less likely to be buried out of sight. Have you ever bought a tee shirt, thinking you were running out, only to discover a pile of shirts in a corner of your closet that you had forgotten about? Alternatively, have you ever pulled your hair out trying to remember where you put your favorite pair of jeans (because you’re too frugal to buy a replacement when you know its there somewhere?). The Konmari method (partnered with a capsule wardrobe) can save you money, time, and frustration. Our kids shared a room before we moved. In our new house, we gave our daughter her own room, which left us a dresser short. 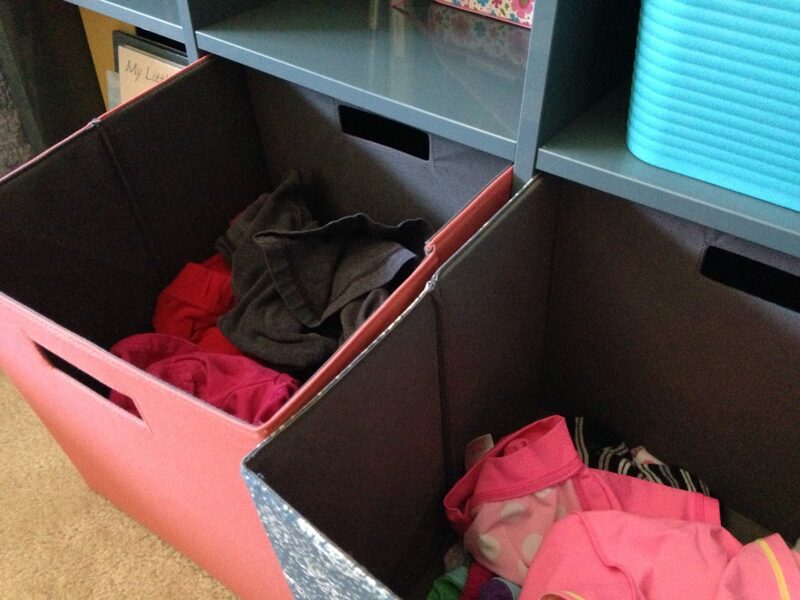 Instead of a dresser, we decided to purchase the IKEA Kallax shelving unit (2×4) for her room, ordering four of these bins from Target (they’re cheaper than IKEA baskets, if less sturdy) to hold pajamas, underwear, socks, and shorts. Her shirts and pants are hung in her closet. The upper shelves house her books and projects. After several weeks of folding her pajamas and shorts, I realized the Konmari method was better suited to drawers than bins. I decided to experiment: what if I just stopped folding her clothes altogether? The types of clothes occupying her bins didn’t really need to be folded. It’s been a few weeks now: I still save time by not folding, and she can put her clothes away faster than before. The KonMari Method saved my life as well. I used to be one of those folks who could not understand why all of my underwear and shirts always took up so much space. Now I don’t have to worry about that anymore. In fact, when I put clothes away the method forces me to keep things neat all the time. I think I will purchase small to medium size bins to keep my socks even more organized. Thank you for your post. What clothes do you keep in her bins? Hey Nicole! Her pants, skirts, underwear, and pajamas go in her bins. Shirts, dresses, and sweaters/sweatshirts get hung up. We used the KonMari method to simplify our home just before our new baby was born. At first, the new folding method took more time, but now I am SO happy with it, for all the reasons you mentioned! My 4- and 2-year-olds in particular just have to pick out their own clothes every day, so it’s great for them to see all their options and choose without pulling out everything. In order to keep like items together, I repurposed some small boxes and put them in the drawer to keep socks and underwear together, as well as onesies and tights/leggings. The onesies and leggings don’t get folded in thirds but rolled into little sushi rolls (like how Marie Kondo does for socks) and tucked in the box vertically. Love it! The small boxes sound like a great idea. I’ll have to check back in with you for the onesie folding if (a big if right now as our toddler is the WORST sleeper) we have another baby. Baby clothes seemed to defy the KonMari method no matter what I tried!